California wild fires have displaced thousands and killed far too many. On Monday, these people — many of whom had never touched a horse before — helped evacuate these horses to safety. Two Facebook resource groups, Napa/Sonoma Fires Animal Evacuations and Solano County Horse/Livestock Fire Evacuation Help Page, have become resource hubs for donation information, volunteer recruitment and pet-owner reunification. 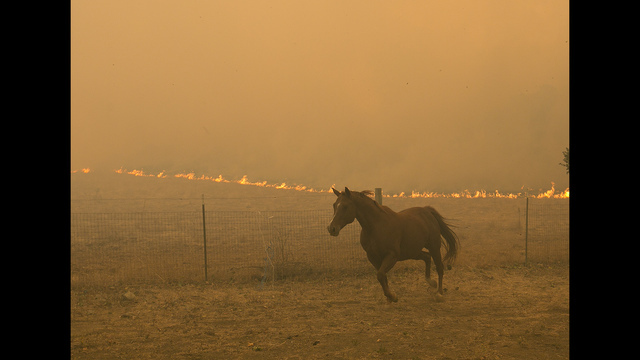 There is also a spreadsheet posted on the Solano County Horse/Livestock Fire Evacuation Help Page to help people with horses and livestock find shelters and volunteers to transport them. As I find more ways to help, I’ll report them. Such devastation after the hurricanes and the flooding. It’s hard to take it all in.